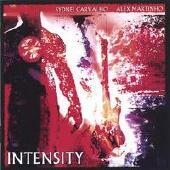 The Brazilian duo of Alex Martinho and Sydnei Carvalho really impressed me with their 2005 release “Intensity.” “Intensity” proved to be an album chock-full of meaty riffs, catchy melodies, and tasty lead guitar. 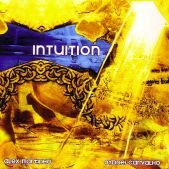 For those of you that liked “Intensity” you’ll like “Intuition” as well. “Intuition” shares a lot in common with its predecessor. Like “Intensity,” “Intuition” is bold and bright, aggressive and seductive, and, best of all, very fun to listen to. Mixing instrumental tracks and vocal tracks always seemed like risky business, but it works here as the four tracks that feature vocals are structured and have melodies that are enhanced by the vocals. No matter whether the tracks or vocals or instrumental there is a passion to the playing of Martinho and Carvalho that transcends the mundane. Overall, “Intuition” is slightly more epic in sound and style while retaining the impressive hard rock rhythms and variety heard on “Intensity.” At nearly sixty minutes running time, “Intuition” has enough variety and expert pacing that makes the sixty minutes engaging at all times. “Intution” was produced by Sydnei Carvalho and co-produced by Alex Martinho and Glenn Zolotar. The production is loud and clear – often a difficult combination with guitar instrumentals, but done quite well here. Alex Martinho/Sydnei Carvalho are joined by Fabio Lessa on bass and Rodrigo Martinho on drums. Vocals performed by Rafael de Castro. Guitar legend Andy Timmons guests on two tracks. For more information visit http://www.sydneicarvalho.com.br and http://www.martinho.com. I seemingly get guitar instrumental records out-of-the blue from artists that I've never heard of. More often than not I am generally impressed with the quality of the playing and the quality of the recording. But basically, due to time limitations, I rarely feel compelled to listen to those artist's works after my review responsibilities have been completed. Sydnei Carvalho and Alex Martinho's "Intensity" is an exception to that reality. Based on my initial few listens to "Intensity" I get the feeling that both Sydnei Carvalho and Alex Martinho are seasoned, accomplished guitarists and songwriters whose musical careers have never really gotten the attention they deserve outside of Brazil. However, "Intensity" should garner this duo positive publicity because it is a solid, predominantly instrumental record that focuses on driving hard rock rhythms and a keen sense of melody. That's a winning combination in my book. The mad stomp of "Double Vision" may be the best instrumental track I've heard this year. The title track features a torrential flood of notes that could probably serve as a soundtrack for when levees break. The brief respite of "Two Ways, One Path" and the subtle "The Shoe Maker" show that the Carvalho/Martinho team can play ballads as well as rockers. The two-parts of "Seven Circles" is sweet treat for the ears as tracks wind and twist their way across expansive sonic terrain like a never-ending journey. Additionally, a number of tracks feature vocals, but the bottom line is that it's the instrumental tracks that get the blood flowing on "Intensity." "Intensity" was produced by Sydnei Carvalho and co-produced by Phillip Colodetti and Alex Martinho. The sound of "Intensity" is quite good with only a few parts where the density of the music seems to push the boundaries of what might be expected on a record of this type. Sydnei Carvalho and Alex Martinho play guitar and are joined by Fabio Lessa on bass and Rodrigo Martinho on drums. Vocals performed by Rafael de Castro.